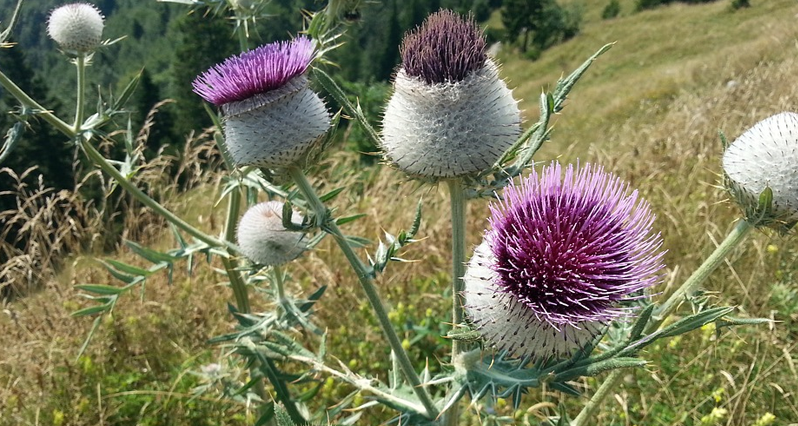 Milk Thistle is the classic all-purpose liver herb. We can run into problems, however, if phase I is running faster than phase II. After all, phase I makes toxins more chemically reactive – in other words, more toxic – and if phase II isn’t ready to jump right in, these newly powerful toxins may damage the liver. We see this illustrated with the herb sassafras. Historically, in reasonable doses, it has been used to support the liver, more recently, in higher doses (in animal studies), it has hurt the liver. Turns out, sassafras upregulates phase I but not phase II. Still, even with both phases of liver detoxification, the liver simply cannot completely neutralize most toxins. They’re neutralized a little bit, then they still need to be excreted, either filtered from the blood by the kidneys, or dumped into the intestinal tract with the bile. But this creates another problem: the intestines aren’t just a passageway out of the body; we’re also set up to absorb things from our intestines. Toxins can be dumped into the gut, only to be re-absorbed, again and again, not only increasing the toxic load on the body, but overworking the liver as it has to do the same job twice, three times, etc. The liver helps out by making toxins harder to re-absorb, but this isn’t foolproof. This is where fiber comes in. Fiber binds up toxins and keep things moving along down there. Ultimately, the health of the gut impacts the health of the liver – and the body in its entirety. Anyways, this brings us to what we can actually do for the liver. I wouldn’t be exaggerating if I said that there are literally over 100 herbs, vitamins, minerals, amino acids, etc., that could be useful here. I’m going to narrow it down, rather arbitrarily, to those that I personally like the best. There are two basic things we can do to support our livers: we can help with detoxification, or we can protect the liver itself from damage. That being said, I can’t think of a single thing that will only do one or the other; there’s a lot of overlap. Nevertheless, let’s talk about protecting the liver first. Actually, the liver is pretty good at protecting itself. It has to be. By far the most important thing the liver does to protect itself is to produce a powerful antioxidant called glutathione. And one of the best things we can do, then, is to help our livers make as much glutathione as they possibly can. How do we do this? Well, this is one of those rare instances when I come out and endorse a specific product. Jarrow Formulas makes something they call ThioNAC, which is specifically designed to raise glutathione levels. It’s main ingredient, NAC (or n-acetyl cysteine), is used in hospitals when people overdose on liver-toxic Tylenol. ThioNAC is one of the best things to protect the liver over a long-term basis; it’s the best thing I can think of to protect e liver during short periods of intense strain. Beyond this, there are literally dozens of herbs that will protect the liver. Rather than single out any one, I’d look for a good combo formula that contains some combination of milk thistle, picrorhiza, schizandra berries, reishi mushroom, dandelion root, and/or turmeric. Milk thistle is by far the most heavily-researched, but there is some talk now that picrorhiza is even better. More about picrorhiza later. Lastly, I want to mention something that most people don’t think of as “for the liver”: whey protein. Whey protein is really one of my very favorite things we sell. Add frozen berries and half a banana and you’ve got breakfast in 2 minutes. Secondly, if you get one that say it’s “undenatured” and that does NOT say that it’s hydrolyzed, you are getting a whole raft full of health benefits which I won’t go into here. Thirdly, a good whey protein shake with fish oil or flax oil for breakfast is one of the best ways to control sugar cravings and maintain energy levels throughout the day. And finally, there has been research where a whey based shake taken daily by normal, healthy young people was actually quite good for the liver. Which brings us to detoxification. One of the best ways to increase detoxification is to increase the flow of bile out of the liver (using herbs and substances called “cholegogues”). As I mentioned earlier, bile is the vehicle the liver uses to excrete fatty residues into the gut. Increasing the flow of bile, then, not only detoxifies the liver, but can lower cholesterol levels. It’s also an old naturopathic way to help with skin conditions such as acne. I forget where I read the recommendation of using Oregon grape root (a nice liver stimulant and cholegogue) together with zinc for acne, but I’ve been mentioning that to people for a number of years now, and it seems to work most of the time. Gentle cholegogues such as artichoke, dandelion root, burdock, and yellow dock are all suitable for long-term use. Stronger cholegogues such as boldo, celandine, and black radish should probably be reserved for shorter-term intense detoxification, for a once- or twice-yearly cleanse. Lecithin is an often-overlooked therapy for the liver, but one that I believe deserves special attention. While the herbs I mentioned above stimulate the flow of bile, lecithin is a raw material for making bile. It helps dissolve fats (including cholesterol, pesticide residues, and excess hormones) so they can move out of the liver, and out of the body. There’s been some research recently where lecithin really helped with fatty liver (or steathosis). Try throwing a tablespoon of lecithin in with your salad dressing, protein shake, or pilaf. It doesn’t taste like anything, but makes the food feel creamier. It’s nice! Another traditional way to stimulate detoxification is by sipping on “bitters,” which not only stimulate the flow of bile but other digestive functions as well. Many cultures, especially those that consume heavier, more processed foods (i.e. European cultures), will sip digestive bitters after a heavy meal. My favorite bitter is a little-known herb called picrorhiza. First, as noted an authority as David Winston (trust me, this guy’s an authority), says he considers it the best liver-protective herb he knows. And secondly, as noted an authority as myself (trust me…) will tell you it’s the single most bitter thing on Earth! Ten drops of the tincture in a glass of water is a nice digestive and liver tonic. If you want to experience how bitter something can be, come on in, I’ll be happy to give you some to taste! You can buy glutathione in capsules, but this is not very effective, since stomach acid destroys most of it before it can reach the liver. We really need the liver to make its own glutathione. Do you remember about a year ago, there was that kid who nearly died of a Tylenol overdose? And all the papers reported how the hospital gave him a drug that saved his liver, and thus, his life? Folks, it wasn’t a “drug” – it was a nutritional supplement: it was NAC! Do you think we could get some good press for a change? !